Famous warrior, hereditary bii and governor of tribe, organisor of liberation fight against colonial politics of Russian empire. 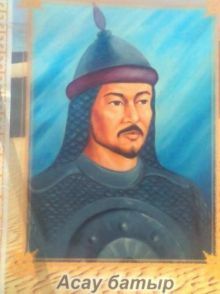 Asau Barackuly (1763-1864) was famous warrior, hereditary bii and governor of tribe, organisor of liberation fight against colonial politics of Russian empire. In 1783-1797 participated in rebellion of Syrym Datuly. In 1822-1826, was one of the organisor of liberation fight led by Zholaman Tlenshiuly. During his last fight with his many brothers and sons organised many attacks to Russian military outpost and settlements. He controlled large tribal departments, had huge influence among the people and neighboring regions. Together with his tribe he travelled in steppe between the River Emba, Sagyz, Temir and sands Usturt, Donyzdau in neighboring Khiva lands. He had social and political relations with the Khiva khanate. There are many historical records about Asau Barackhuly. He was buried in Sam-Turysh area, current Beineu district Mangistau region.